Advantech, a leading embedded computing solution provider, announced the release of its new server grade board powered by Intel Atom® processors with 16 cores. 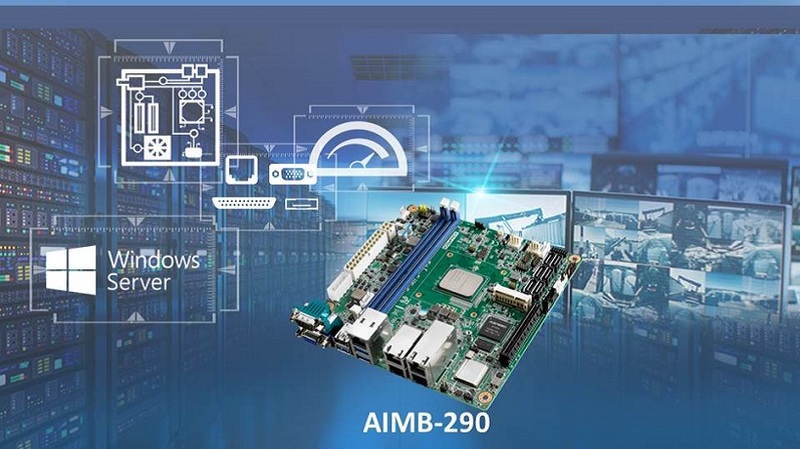 AIMB-290 mini-ITX server board is designed with latest generation Intel Atom® C3000 processor series designed for high processing server applications. Intel Atom® C3000 processor series offers the best performance per watt and not only delivers the lowest thermal design power (TDP) rating, but also provides unprecedented levels of configurable high-speed I/O. Mini-ITX AIMB-290 supports up to 16 cores for best-in-class performance. It’s height meets 1U chassis dimensions and is only 170 x 170 mm which is ideal for small business server with limited installation space. AIMB-290 supports EMMC5.1, dual channel DDR4 with ECC and non-ECC memory for U-DIMM and R-DIMM types. Features include 4 x LAN (dual 10GbE and dual Gigabit Ethernet), 3 x USB 2.0 ports, 3 x USB 3.0 ports, 2 x serial ports (1x RS-232/422/485, 1x RS-232), and 1 x mPCIe w/ mPCIe module or mSATA. Moreover, for flexible application requirements, it has two power inputs, a 4-pin DC12V input, or an ATX 24-pin connector. AIMB-290 also supports external storage (NAS), SDN/NFV equipment, security appliances (VPN, firewall), routing, dedicated hosting, control planes and more. AIMB-290 supports IPMI with BMC controllers that administrators can manage and monitor servers with to make sure equipment is operating normally. If any problems occur, administrators can read event logs and restart equipment. It also can be setup for special situations and the system will send an alert message to the manager by e-mail or text message. IPMI uses an independent LAN port on AIMB-290 to ensure the system cannot be compromised. AIMB-290 can also support TPM to add hardware/ data management security features. AIMB-290 can also combine with Advantech’s WISE-PaaS/RMM solution to add more applications. WISE-PaaS/RMM is an IoT device management software platform which comes with more than 100 RESTful APIs including account/device management, device control, and database management. WISE-PaaS/RMM not only helps create new web services but also helps to integrate functions and data with its powerful management tools. Furthermore, IPMI and WISE-PaaS highly enhances connectivity for hardware, software, devices and sensors to help customers quickly develop their own services.